If you have an office job, chances are you spend most of your day sitting down. Sitting for the majority of the day can lead to aches and pains, especially in your back. It can be expensive to buy a whole new office chair, but you can use a cushion to help with back pain. Here we’ll review some of the best back supports for your office chair. How Does An Office Chair Hurt My Back? Maybe you have been dealing with back pain for years, but never thought it was your office chair that was causing the problem. Sitting in an office chair all day can create new back problems and exacerbate existing conditions. This is the biggest problem with most office chairs. Many office chairs do not promote the use of good posture while you are sitting down. If you pay attention to the way you sit, you will notice that as the day goes on you end up slouching down or hunching over your keyboard. Poor posture puts a strain on your neck, spine, lower back, and even your hips. All of these things are really important to keeping your back pain free. It can be hard to remember to sit up straight when your day starts to get busy. That’s why a back support can be a great way to ease back pain. The best back and lumbar pillows will help place your back into alignment and support your whole spine so you don’t experience aches or pain. The way you sit in your chair could be placing too much pressure on some of your joints and soft tissue. If you tend to lean forward when you work, then you are tightening the muscles around your hip joints and lower back. If you hold that position for a long time, you create stress and pain in those joints. Throughout the day, your spine naturally compresses. Everyday activities cause this to happen but sitting all day makes this worse. A compressed spine can lead to a sore back and make it uncomfortable to go about your day. 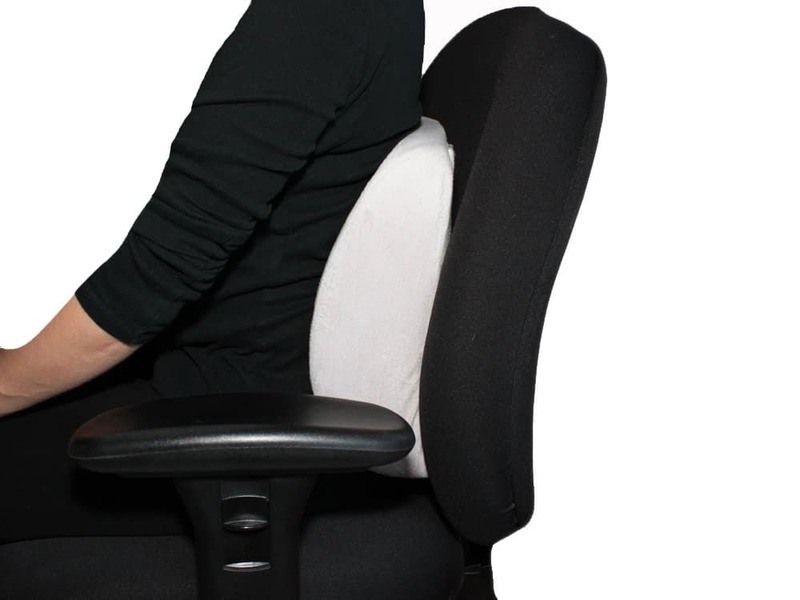 Depending on the strength of your back, any previous injuries or pain you have, and personal preference, it is important to choose the right material for the best back support for your office chair. 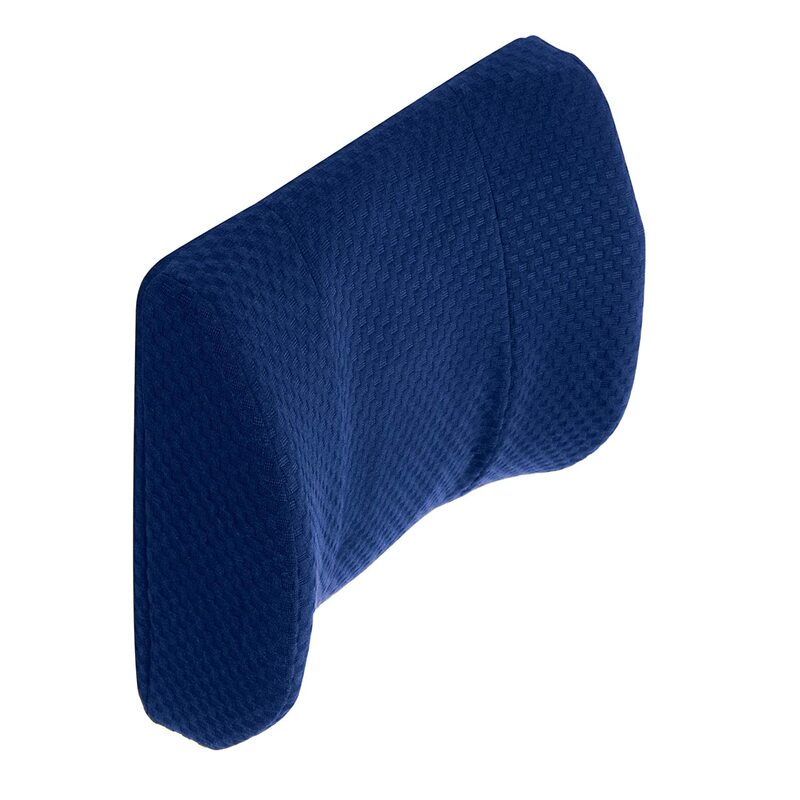 This is by far the most popular and easily found material for many back supports and lumbar pillows. Many people find that this is the most comfortable cushion for their backs. Memory foam is a high-density polyurethane foam that will mold to the unique contours of your body. Not only is it very comfortable, it is also very supportive. If you have a very sore or sensitive back, the comfort that memory foam can provide might be the best option. Some memory foam back supports are firmer than others, so if you need something more supportive you can find a memory foam cushion that will work for you. This is another option for back supports. It is not as fancy as a memory foam cushion, but it can offer good support and comfort. These types of supports have a flexible wire frame and are then covered with mesh. The shape of the support will help cushion your spine, put it into proper alignment, and keep the natural curve of your lower back. A mesh back support is good for people who need a sturdy support for their back and chair. Mesh fabric is also more breathable than memory foam and will keep you cool while you’re using it. These supports tend to be less expensive as well. There are a few options for back supports that are made out of plastic. These work best for people who need an extreme form of support. A plastic support is harder to find, but some medical supply stores will still carry a few. Do not choose a plastic support if you have a very sensitive back because it could cause more pain. You might be able to find a few models that have a plastic core and are then covered with a layer of foam to add a little more comfort. Do I Need A Lumbar Support Or Just A Back Support? First, here's a good video explanation of this issue from our friends at Sitting Well. It all depends on your individual needs. A full back support is the best choice for people who might have had a previous back injury or pain and sitting is causing even more problems. The full back cushion can help keep your spine in alignment which could eliminate the pain you feel while you sit. If you are just having problems with your lower back, or the lumbar region, a lumbar pillow might be the best option. A lumbar support will mainly support your lower back and help you keep the natural curve of your spine in the lumbar region. These supports help keep the strain and tension out of your lower back and allow you to sit in your chair with ease. 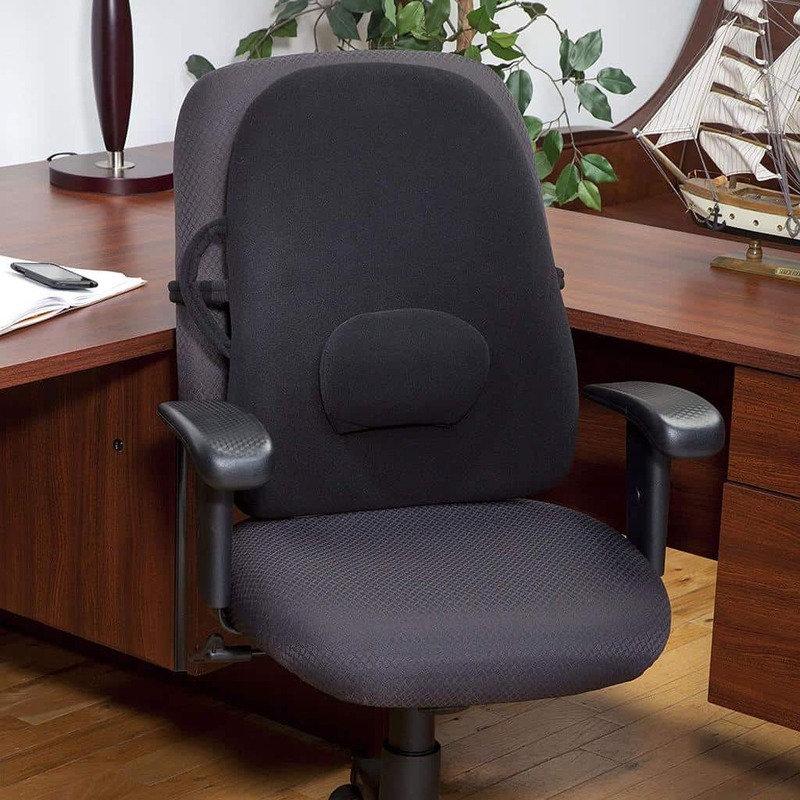 There are also a few options that combine a whole back and lumbar region support. These will combine the best of both types of cushions and keep you comfortable the whole time that you are sitting. They can be a little more expensive, though. When it comes to the comfort of your back, you really don’t want to risk it with cheaper options. Sometimes the less expensive cushions are poorly made and will cause more harm than help. With that being said, purchasing a back support or lumbar pillow is going to depend on a few different factors. The type of material you want is going to affect cost. Memory foam will be more expensive than mesh or plastic. The kind of back support you choose will also affect the cost. Usually, a full back support will be more expensive than just a lumbar pillow. Most back support cushions will range from $20 to $50. You can find some that are cheaper than that, just be cautious of poor quality. Overall a back support for your office chair is going to be less expensive than buying a brand new chair. The LuxFit back support is less expensive than many support cushions available, but it is still made with high-quality memory foam. It also has a velour covering that can be removed for easy washing. There is an adjustable strap that helps keep the pillow in position while it’s in use. This cushion is a little softer, so if you need a more supportive back cushion then you might want to look for a different option. The LuxFit does come with a two-year warranty, so if there are problems it could be covered. The EverRelief is a support pillow that is made specifically for the lumbar region. It is made of memory foam so the cushion will mold to your lower back while still supporting. It has a light grey cover that can be removed so you can wash it. This lumbar pillow is small enough to make traveling with it easy, so you can use it wherever you need to sit. The only downside to this cushion is that it doesn’t have an adjustable strap. It might move around while you are using it and you might have to readjust it every so often to make sure it is in the right place. This is a highly durable memory foam lumbar support pillow. It helps your back by supporting the upper back to relieve pressure on the spine and lower back, cushions the vertebrae to relieve lower back pain, and supports the pelvic region to give the spinal column proper alignment. The Easy Posture cushion has a grey mesh covering that helps keep the cushion cool while you are using it and it also has two adjustable straps. Both the straps can make it easy to keep it in place and will fit a variety of different chairs. It’s small and light enough to make it easy to use in a variety of different places. The Aeris back pillow is another lumbar support cushion that is made with memory foam. It has a 25” adjustable strap and a velour cover that has a zipper so you can remove and wash it when needed. There are also a variety of colors to choose from so you can match your office chair and decor. The other nice feature of this back pain pillow is that it comes in two different sizes. The standard size will fit in most chairs, but you also have the option for the queen size for bigger desk chairs. This pillow also has a lifetime free replacement guarantee so if the pillow is damaged or breaks down, it will be replaced for free. The Obus Forme Ergonomic Backrest is a full back support with a lumbar support cushion. The price is on the higher end for back supports, but it offers a lot of great features. This cushion is made of three different layers. The core is made of polycarbonate carbon that is impact resistant and adds a very supportive base, then it is covered with memory foam and a hypoallergenic cover. This support is really nice because it has a removable lumbar cushion, so if you need the extra support you can use it or take it off if you don’t need it. There is a handle that makes it easy to transport and has a strap to keep it in place on your chair. It also comes with a free neck pillow as a bonus gift.